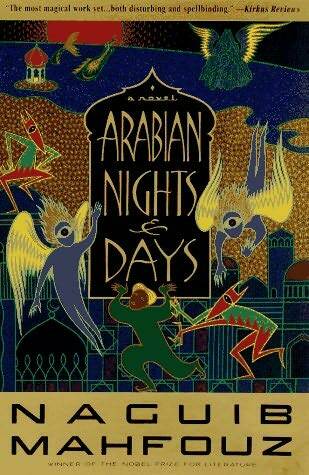 Arabian Nights and Days, by nobel prize-winning author Naguib Mahfouz. I know you’re not suppose to judge books by their covers, but I confess this is one I picked up almost entirely because I liked its design. It’s gorgeous and weird and it caught my attention immediately, and whoever did the design is damn good at their job. Lucky for me, it turned out that the story inside was just as delightful as the packaging, albeit with a very strange sense of humor. Arabian Nights and Days is, as the name suggests, a sort of re-telling of the Arabian Nights stories. I’ll confess right up front that my knowledge of the original stories is hazy at best; I only recently found out that Aladdin isn’t part of the original collection at all, but rather was added by later folklorists. Thus, I suspect that I missed a lot of parallels between the original tales and this re-telling, but it didn’t suffer for my lack of knowledge. The book opens on the murderous sultan Shahriyar just after he’s decided not to murder his storytelling wife Shahrzad, thereby ending his reign of potential-wife-murdering spanning about a decade. From there, the focus quickly shifts to the various nobility of the city and their (often unknowing) dealings with djinn (genies), who use humans both for sport and entertainment, and to prove their personal points about moral uprightness and devotion to Allah. It is not uncommon for these games to end with (sometimes innocent) dudes getting beheaded, which is actually quite humorous in a way that’s kind of hard to describe. The whole book is dripping with that odd not-quite-reality feeling particular to fairytales, which gives you just enough space to laugh at the characters even as you feel bad for them. The prose (credited to the translator, Denys Johnson-Davies, as much as Mahfouz) is fairly concrete, but still evocative, full of rich textures and neatly drawn characterizations that help you move through the story quickly, even when all that’s happening is a bunch of rich dudes moralizing. Add in a heavy dose of satire and you have this delightfully bloody little book. I can’t wait to read it again, after learning a bit more about the original stories of course.